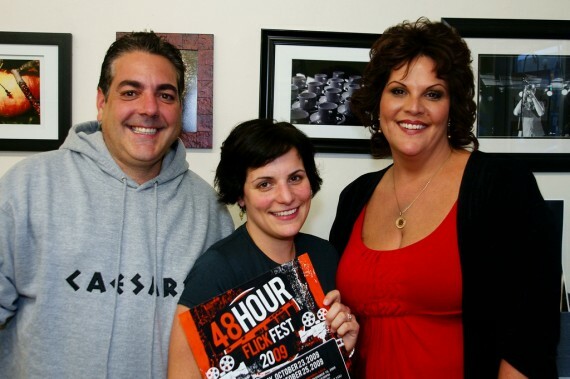 Mark Boscariol (producer), Vanessa Shields (organizer) and Debi Croucher (marketing) pose for a photo during a press conference for the WIFF's 48 Hour Flick Fest, last fall. The Windsor International Film Festival and Windsor Arts & Music Monthly are looking for music video submissions for the second Windsor Music Video Competition. The call went out this afternoon to musicians and filmmakers — whether with professional equipment of something as simple as a cell phone — to create a short film to celebrate local music talent. A $20 registration fee is required, and the competition is open until April 30th 2010. Have a look at the WMVC’s website for rules and submission information.